However, we’re still fortunate to see individuals and families thriving as a result of the 4Children partnerships. We are encouraged by their stories. They are tangible signs of 4Children’s success in the 12 countries in which we work. One such story is Mother Helene’s. Mother Helene lives in the city of Kikwit in the Democratic Republic of Congo. After falling ill, she went to a health clinic, was diagnosed with HIV and was initiated on antiretroviral therapy. Through the health center, more than her physical health was restored. The Coordinating Comprehensive Care for Children (4Children) project works with the health care center to assure holistic care for clients receiving HIV treatment. Through the project, Mother Helene was enrolled in a support group that meets in the medical clinic. In addition to meeting her psychosocial support needs, they also referred her to a positive parenting group which helps her to better connect with her children and especially how to discuss difficult topics with her teenagers. Mother Helene was intrigued by a session about savings and income generation and after expressing an interest, she was referred to a savings group. 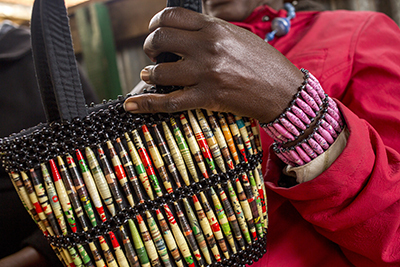 With the credit she earned from savings group, she started selling bags, and after receiving a cash transfer grant, she diversified her products to include fresh meat and shoes. The income generating activities have given her hope for each day, which has helped her to maintain treatment. The case managers in the clinic also counseled her to test her children and they have been found to be HIV negative and part of the HIV free generation.